Experimental luthiers are luthiers who design instruments with altered parts and different shapes. These luthiers create original instruments that are as good for art as for music. Square boxes, rounded shapes, pegs at the bottom. 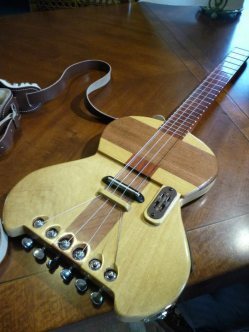 Experimental luthiers are so creative that you can find almost anything on the market. Most of the time they will make instruments that don’t even look like a regular one, but more of like a box-shaped piece of art. These luthiers are willing to create almost whatever you could imagine and the best part is that they are willing to customize their pieces for you. The willingness to customize, create and change is what drives them, so if your dream is having the most amazing instruments to show around, contacting an experimental luthier is the best you can do. This process of discovering is benefiting the folkloric music in ways you will not even imagine, starting by modifications, that are the base ground of how we got these many different kinds of instruments in this world.